Every home owner has that list of "TO DOS" around the house; the small projects that we never seem to find time to complete. 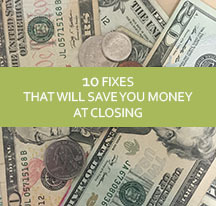 Before you list your home for sale it is time to turn those "TO DOS" in to "DONES" and by doing so you will save money at closing because the buyers won't be seeking money to fix them. Light bulbs and light fixtures that don't work. Crooked or broken cabinet doors and drawers are usually the result of a missing screw or two. Slow drains during a home inspection raise concerns about the plumbing. Doors that don't latch properly can be fixed by any handyman. Windows that don't open, get stuck open or can't be locked can be a big adjustment on your post inspection, like plumbing. On the subject of tile work, make sure your grout is clean in your bathrooms. Working outlets are a simple replacement and will be checked by the home inspector. Peeling or unfinished paint jobs are detrimental to both the sale price and the inspection. List your home with a licensed Realtor.